Our instructors were the first to be transformed by this place. Tom Hart moved to Gainesville from New York City in September 2011 to help forge a simpler, more artistic life for himself and his family. 5 weeks later, tragedy hit and he spent the next three years making the graphic memoir, Rosalie Lightning, about his daughter, in this space. In April 2012, Justine Mara Andersen walked into SAW, having moved to Florida with a house in foreclosure and virtually no money, no friends, and no family. Tom and she recognized each other as kindred souls, and she became SAW's drawing maven. As Tom worked on his book, she worked on her graphic memoir, detailing transitions, conversions and lost friends. SAW welcomed her, and she said goodbye to a lot of her past. She picked up the guitar again. She burned her last pair of shoes. SAW changed her life too. A place of transformation is a place you can be vulnerable, and be rewarded. SAW is a place where if you come here as yourself, you are given gifts to transform yourself. His Hutch Owen series of graphic novels and books, were nominated for all the major industry awards. His The Collected Hutch Owen was nominated for best graphic novel in 2000. He was an early recipient of a Xeric Grant for self-publishing cartoonists, and has been on many best-of lists in the Comics Journal and other comix publications. He has been called “One of the great underrated cartoonists of our time” by Eddie Campbell and “One of my favorite cartoonists of the decade” by Scott McCloud. His daily Hutch Owen comic strip ran for 2 years in newspapers in New York and Boston, and his “Ali’s House”, co-created with Margo Dabaie was picked up by King Features Syndicate. He was a core instructor at New York City’s School of Visual Arts for 10 years, teaching cartooning to undergraduates, working adults and teens alike. Among his students were Dash Shaw, Sarah Glidden Box Brown and other published cartoonists like Leslie Stein, Jessica Fink, Josh Bayer, Brendan Leachand many others. 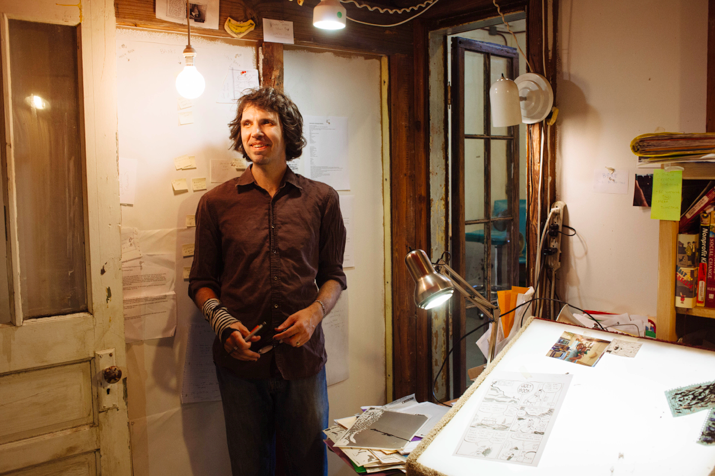 He has taught comix and sequential art at schools and institutions all around New York City for more than 10 years, and has conducted week-long workshops from Maine to Hawaii. He also teaches sequential art in the School of Art and Art History at UF. Justine Mara Andersen was mentored by and learned from top names in the industry, including such luminaries as P. Craig Russell (Elric, Sandman), Val Mayerik (Punisher, Conan), Frank Thorne (Red Sonja), John Workman, Jim Steranko and Jeffrey Catherine Jones, but struck out on her own to create her long-running series Mara, Celtic Shamaness for Fantagraphics as well as working as an inker and illustrator for DC Comics, Image Comics, Wizards of the Coast (D&D, etc. ), Lucasfilms and other clients.